Ok...so you probably have to see it in person, but I laughed. I would try to find a link for it, but how the heck do you do that? It's late and I'm rambling. You can imagine how excited we were to see today that Urban Outfitters is now carrying an image of us (or so we like to think!) and offering it to the public at a steal of only $28! We look a bit serious and solemn compared to our cartoon portrait here on our blog, don't ya think? Nevertheless, we can't wait to hang this up in our own habitat! Why: to clear out the clutter! I'm taking some donations down to the church tomorrow morning and will stay to help price the items that have come in already. I'm super excited to get a sneak peak and first dibs on some of the good stuff! (Don't worry, I won't take it all) You guys should check it out if you are around this weekend. I didn't make it last year, and I'm heading out of town on Friday, so that's why I'm giving myself a preview of the goods this year. :) The houses that are participating will have a sign in the yard, so it should be easy to find your way around...there might even be a map available on the DH Civic Association website. Bored at work this morning? 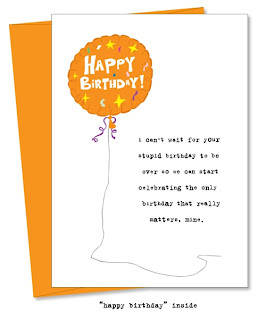 Check out Uncooked Greeting Cards for a good laugh. They are random, witty, stupid, and weird...but hopefully one or two will give you a good chuckle. They're also having a sale right now! "I can't wait for your stupid birthday to be over so we can start celebrating the only birthday that really matters, mine." So, the mess I've been making hasn't been in vain. My friend Michelle taught me a fun little sewing project and I've been going a little crazy with it! Here are some photos of what I've been up to. I call them fabric flowers. They are soooooo easy and quick to make. I think I've made about 20 of them. I'm going to put pin backs on some of them so they can be worn on blazers/jackets/scarves. The others will probably get used for other craft projects. I hope to have tutorial with photos for you tomorrow so that you can try out this fun little project. Stay dry out there Georgians, Atlantans, and fellow Decaturites! I love going to flea/antique markets. My boyfriend doesn't understand why I like to look at other people's old stuff...and neither do I. It's just something that makes me happy. If you haven't been to the Scott Antique Market you need to check it out next month. October 9th, 10th, and 11th. If you really want the full experience you should plan to spend at least two days there. There is just too much stuff to look at in one day. Also, the two buildings they use at the Atlanta Expo Center are right across the highway from each other, so you have to take a shuttle from one to the other. -Wear comfy shoes. There are a LOT of booths to look through and the buildings are large. -Bring an extra bag or a large purse to hold the things you buy. Next time, I'm going to take a small rolling suitcase because I have a tendency to buy things that are awkward to carry. -Pack a snack. They have food and drinks available...but it's kind of pricey. Here are some pictures of the cool stuff I found while there. Amazing piece of furniture! 31 different drawers. That's my organizing dream right there. I'm already making a list of what I would put in those drawers. The bench and the lamps - not the naked mannequin. It's hard to see the lamps, but they were very cool squares of wire with different fabrics hanging down to cover the huge bulbs. Huge "Open" sign that was about 4 feet by 2.5 feet. You could feel the heat radiating from it about three feet away. Lots of vintage hardware pieces. My friend thought it would be cool to get a bunch and hang them on the wall as an art piece. You could also put the handles back on and use them as a coat rack on the wall. For those of you not in Atlanta. Check out Hell's Kitchen Flea Market in NY and the Rose Bowl Flea Market in California. Just in case you were wondering...or not friends with them on facebook...The Yogurt Tap has two new flavors out!!!! MMMMMMmmmmmm! Side by side so you can swirl them. The banana tastes so fresh and it's not overly sweet. The peanut butter is just to die for. Creamy, but not in a fatty kind of way. Oh goodness. It's just so good. Swirl the two together and add granola and chocolate syrup. Super tasty. I am ALWAYS looking for good gifts for guys. Men are generally pretty hard to shop for, don't you think? While surfing around through various blogs and such...instead of going to bed....I found this! 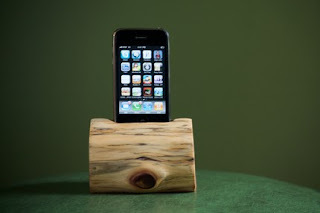 Photo from Woodtec's Etsy store. 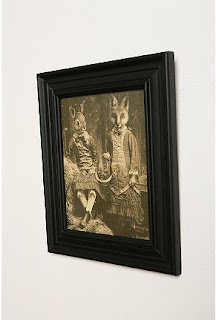 This animal print, by Catherine Ledner, makes them slightly less creepy...but not by much. However, the other animal prints on her website are great! I found her work featured on a blog I frequent, but check out the rest of her work on her website. If you scroll over the 'Animal Prints' button on the top right you can go through all the prints she has. Otherwise the home page slide show will just give you the first set. I'm partial to the goat, hedgehog, raccoon, squirrel, zebra, fox, and hedgehog #2. Make sure you check out the expressions on some of the animals faces - some are haunting/creepy while others are just hilarious! Her choice of backgrounds for the animals is also quite fabulous. 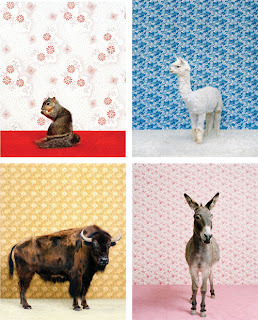 Most of the designs are simply gorgeous and she pairs them really well with the animals. There is such a strong difference between the live animals and the repetitive, brightly colored backgrounds, but the end effect is wicked cool. Wicked cool? Hehe. Had to channel my northern friends for that one. :) Do you have any favorites? 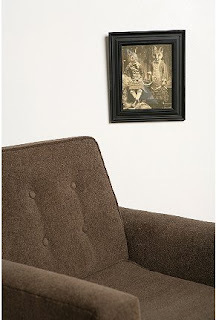 What would you pair together and put on your wall? Have a great start to the beginning of the week! J Fox will be back soon to share her travel stories with us all. I've mentioned it before, but in case you missed that post...we're in love with The Yogurt Tap! Yummy fro-yo goodness just a few blocks away from work. What could be better?! Walk inside and read the directions. Pick your yogurt from the six different flavors available (flavors rotate). Walk over to the toppings bar and top your yogurt with things like fresh fruit, cereal, nuts, candy, coconut, chocolate chips, nutella, caramel, and more. Pay 39 cents an ounce, find a spot to sit (inside or outside) and enjoy! Hopefully you all had a good Labor Day weekend! J Fox is in Spain right now...lucky girl...so I'm holding down the blogging front. Anyone make it to the Decatur Book Festival? I always seem to miss it. I went up to North Carolina to see my dad's side of the family. We did a little swimming, played few innings of baseball with my younger (yet super competitive) cousins, ate some good southern food (okra, corn, peach cobbler...mmm), and just chit-chatted like all good southerners do. Ok, so I got to sleep in - always nice. Then I went to get my haircut with my favorite hair stylist Adrianne, at Grow. She gave me a "long bang". I LOVE it! For those that know me...this is potentially a risk, because my hair is super wavy/curly and usually bangs don't work with hair like mine. However...Adrianne is a hair goddess and I always have faith that she won't mess up my hair - and she didn't! I've never had a bang before, so I'm still getting used to it, but I think it makes me look a little older. That's always a plus because people still think i'm in school (not college, high school...yeah). Anyways, go see Adrianne for your next cut/color/whatever. She won't let you down. After that I went to the gym with my sis and a friend...and then...we went to The Yogurt Tap. Oh holy goodness!! I have found heaven on earth! Frozen yogurt has never been appealing until now. You have to go and try it out! I got original tart, raspberry, and chocolate with pecans, sprinkles and nutella sauce. Sounds like it might be a lot, especially since it's self serve and sometimes you can go a little overboard with self serve. It was only $3.45!! You can barely get a scoop of Coldstone ice cream for that! It's all organice, fresh, natural, yummy goodness. You have to go try it. I took some to J Fox at work and she loved it as well. We're now hooked. We've been frequenting Parish, in Inman Park, recently to do some morning blogging. With free Wi-Fi, good coffee, delicious pastries, and a contemporary farmhouse feel, how could we not fall in love? Plenty of napkins were used to devour this almond croissant. It was not a pretty sight as the powdered sugar and crumbs flew everywhere. Good thing we weren't trying to impress anyone! We've also tried the plain croissant and the chocolate croissant. They're all tasty - just go for what you're in the mood for. We enjoy sitting at the big, communal, butcher block table, but plan on trying out the tables on the patio as soon as it gets a little cooler here in Georgia. Have you been to Parish? We have to admit we haven't tried the restaurant upstairs yet...maybe one day we'll get up there. :) Check out the menu and the rest of the story behind the restaurant and the building here. So...I finally had time to sit down and try out the tutorial from this post. It was super easy and only took about 10 minutes. I modified it a bit as I was too lazy to pull out the directions and follow them exactly. Peeled all the glue from the flowers. Sewed each flower on one by one. Sewed a pretty pink button into the middle of the flower. One or two stitches for each flower works fine. I would even sew a few flowers together at a time to reduce the number of stitches in the headband. I just picked up a pack of three Goody headbands from Target for about $6, a flower stem from Ikea, and I'll get three cute headbands for about $8! Did you guys make it out?! It was HOT and MUGGY! No surprise though, this is Georgia in August. We made our way down to the park right as the races were starting. We walked in the entrance at Piedmont and 10th and made it down to the "pit" to get a close up look at some of the cars that were racing. I think there were about 40 cars... Here are some of the ones we saw up close. Pretty cool, huh? All the cars were really creative...some just looked safer than others. Luckily they had a few huge TV screens set up so you could see what was going on. It was pretty crowded and it was kind of hard to see the cars go by if you weren't right on the barrier. The red, yellow, and blue arch is the platform that the cars started on. I'm not sure how long the course was...about 1/2 mile? Two turns and a small jump for the cars to go over. Pretty entertaining to watch the jump. That was probably where most of the crashes happened. Oh...best two things about the day...free ice cream cones and free coolers of water all over the park!